The third Alacrity (MSO-520) was laid down on 5 March 1956 at Sturgeon Bay Wis. by the Peterson Builders Inc.; launched on 8 June 1957; sponsored by Mrs. Henry Armstrong the wife of Capt. Armstrong the chief of staff and aide to the Commandant of the 9th Naval District; ferried to Boston via the Great Lakes and the St. Lawrence River; fitted out at the Boston Naval Shipyard; and commissioned there on 1 October 1958 Lt. Theodore W. Pstrak in command. The following month Alacrity moved south to Charleston S.C. whence she conducted shakedown training before becoming a unit of the Atlantic Fleet Mine Force. The minesweeper began operations in the western Atlantic and in the West Indies. Those duties occupied her time until late in 1960 when she embarked upon her first deployment to the Mediterranean Sea. After her return from duty with the 6th Fleet late in the spring of 1961 she resumed normal operations along the east coast and in the West Indies. That employment lasted until February of 1964 at which time Alacrity headed back to the Mediterranean. Her arrival back on the east coast late in the summer of 1964 brought more duty in the western Atlantic. In February 1965 the minesweeper began a four-month tour of duty in the West Indies. Near the end of that assignment in late April 1966 civil war erupted in the Dominican Republic as supporters of exiled President Juan Bosch instituted a military uprising to seize power from the ruling civilian junta. The resultant strife the city of Santo Domingo became a battleground saw the commitment of American marines and paratroopers; Alacrity spent almost the entire month of May helping to evacuate foreign nationals and supporting the troops of an inter-American force sent to restore order. While operating in the western Atlantic and the West Indies Alacrity frequently conducted tests for the Naval Ordnance Laboratory Test Facility located at Fort Lauderdale Fla. and served as a training platform for students at the Mine Warfare School. Those duties as well as refresher training and independent ship's exercises occupied her from the beginning of 1966 into the spring of 1969. 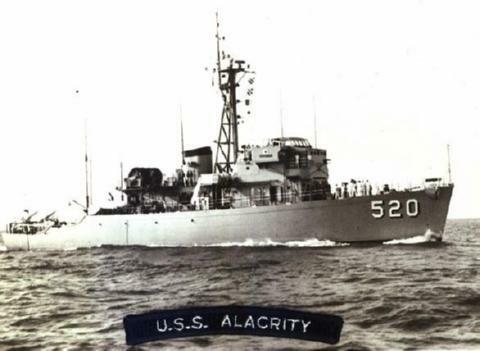 On 8 May 1969 Alacrity put to sea once more bound for the Mediterranean. After five months with 6th Fleet engaged in training exercises and port visits the minesweeper headed back to the United States on 11 October. She reached Charleston on 30 October. Then except for 12 days underway for special operations at the beginning of December the warship spent the remainder of the year in port at Charleston. In 1970 Alacrity conducted exercises out of her home port until mid-June. On the 17th of that month she entered Avondale Shipyards Inc. for a regular overhaul. The minesweeper completed repairs and left New Orleans on 1 December. She returned to Charleston on the 6th and after holiday leave and upkeep resumed normal operations. After seven months of exercises drills and inspections out of Charleston Alacrity headed back toward the Mediterranean on 2 August. She entered the "Middle Sea" late in August and spent September and the first week in October steaming in the western Mediterranean and making port visits. Alacrity returned to Rota Spain on 7 October and two days later sailed for the United States. She returned to Charleston on 27 October and except for a week at sea for special operations in the middle of December spent the remainder of the year in her home port. On 10 January 1972 Alacrity departed Charleston for an eight day cold weather amphibious exercise off the shores of Maine. By the end of January the minesweeper was back in Charleston and in February resumed normal operations. In April she interrupted her schedule to provide support for the Apollo 16 moon shot. She resumed operations out of Charleston late in April and remained so occupied almost until the end of the year. Early in December she returned to the vicinity of Port Canaveral Fla. to assist in gathering data during the Apollo 17 moon shot. Alacrity concluded that duty at Charleston on 8 December and remained in port for the rest of 1972. The warship spent the first four months of 1973 working out of Charleston On 10 May she entered Detyen's Shipyard in Mount Pleasant S.C. for modifications. On 1 June 1973 Alacrity was redesignated AG-520. She left Detyen's Shipyard on 23 July and returned to the Naval Station Charleston where she remained until 6 August. On that day the ship headed south to Jacksonville Fla. where she began further alterations at the Atlantic Drydock Co. on 7 August. The changes were completed by 19 October and Alacrity returned to Charleston to prepare for refresher training. During November and early December she conducted refresher training in the West Indies before returning to Charleston on the 10th to begin the annual holiday leave and upkeep period. Alacrity began 1974 engaged in normal operations which kept her busy until midsummer. On 16 July she stood out of Charleston and embarked upon the final Mediterranean deployment of her active career. The minesweeper operated with the 6th Fleet conducting training evolutions and port Visits until the end of November. She departed Rota on 30 November and arrived back in Charleston on 20 December. The ship continued in active service for another 33 months. Throughout that period she operated in the western Atlantic and in the West Indies on training missions and test-and-evaluation assignments. On 30 September 1977 Alacrity was placed out of commission at Charleston and her name was struck from the Navy list that same day. In December of 1979 she was sold to the Ampol Corp. for scrapping.